Founded in 1892, the ATU today is comprised of over 198,076 members, including: metropolitan, interstate, and school bus drivers; paratransit, light rail, subway, streetcar, and ferry boat operators; mechanics and other maintenance workers; clerks, baggage handlers, municipal employees, and others. ATU can be found in 44 U.S. states and the District of Columbia, and nine Canadian provinces. has given us the political power to improve working and social conditions. developing safer working conditions, education programs and improved labour relations. Regina Transit's roots go back to July 28th, 1911 (as the Regina Municipal Railway) with streetcar operations and when the fare was 5 cents. Originally the railway had ten miles of track, growing to 20 miles in the early 1930s. The "Dirty Thirties" saw huge deficits resulting in major cut-backs in service. With a shortage of gasoline and steel during World War II, streetcar ridership grew dramatically. The 32 streetcars used in 1945 carried 9,000,000 more passengers than they did in 1940. An important event in the system's history was a fire in the "bus barn" on January 23, 1949 that destroyed the building, 17 trolley coaches, nine gasoline buses, five steel streetcars and nine wooden cars with a total loss value of over $1,000,000.00 or $9,750,000.00 at today's rates. At the time, it was considered one of the most destructive fires in western Canada and took the city almost a year to replace the losses. The Regina Municipal Railway barns were build in 1930 and were located at Albert and Fifth Avenue, the barns were designed to house twenty-four single truck cars as well as the maintenance shops and the system's offices. Due to the growth of the transit system, City of Regina and Regina Transit built a new Transit Operation Center (TOC) which was officially opened in 1987 and is located at 333 Winnipeg St. N.
The old barns on Albert St. are still occupied by Regina Transit which house the store room/parts department, maintenance department and it's own in house body shop. 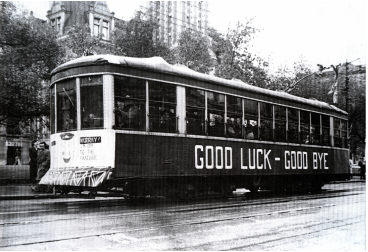 On September 5th, 1950 The last streetcar made its final run through the streets of Regina and the Regina Municipal Railway became the Regina Transit System. Regina Transit provided trolley bus service from 1947 to 1966 using Canada Car and Foundry Brill trolley buses. Since 1955, its preferred transit fleet has been buses because their freedom from overhead lines makes them suitable for detours and charters. An innovation in the early 1970s was its Telebus service, which used a telephone/radio dispatching system to send buses to individual homes. This service ended in the early 1980s because of its high cost. The Regina Transit System (RTS), whose service area is confined to Regina's city limits, maintains a fleet of 124 buses with 193 bus operators. As of Spring 2014, all buses are low floor accessible to handle passengers with mobility devices. During the 20 hours per day (1000 per week) that the buses are on the road use roughly 15,000 litres of diesel fuel and travel approximately 19,000 kms (Monday to Friday) or equivalent to more than 5 Million kms per year. Regina Transit removed the use of drop in coin fare boxes and implemented the BEA Electronic Farebox with Smartcard technology in 2010. Along with the new fare box, Regina Transit installed a video surveillance system, interior and exterior stop announcements and a digital scrolling next stop signbar (with location), which is currently in 100% of all buses. All buses are also equipped with a GPS system which is accessible via TransitLive. The Cash office counts all money brought in from Transit, Meter money and all Leisure centres locker money. Looks after all the agents that sell Transit products and the AAVMS that go with selling. Operates from 06:00 - 23:15 week days. Also provides weekend service and limited service on statutory holidays.